This fully updated edition provides practical advice on how to carry out tissue-based laser microdissection successfully by using the different laser microdissection systems that are available and by applying a wide range of molecular technologies. The contents of the volume explore these techniques that have revolutionized carrying out molecular analysis on specific types of normal and diseased cells and fully utilizing the power of current molecular technologies including PCR, microarrays, next generation sequencing, and proteomics. Written for the highly successful Methods in Molecular Biology series, chapters include introductions to their respective topics, lists of the necessary materials and reagents, step-by-step, readily reproducible laboratory protocols, and tips on troubleshooting and avoiding known pitfalls. 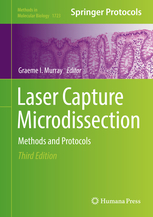 Authoritative and comprehensive, Laser Capture Microdissection: Methods and Protocols, Third Edition seeks to aid researchers generally and pathologists in particular in moving their studies forward with these vital techniques.